I’m delighted to welcome fellow Accent Press author, Marsali Taylor, to my blog today. This is a truly excellent blog, so put those feet up and enjoy! 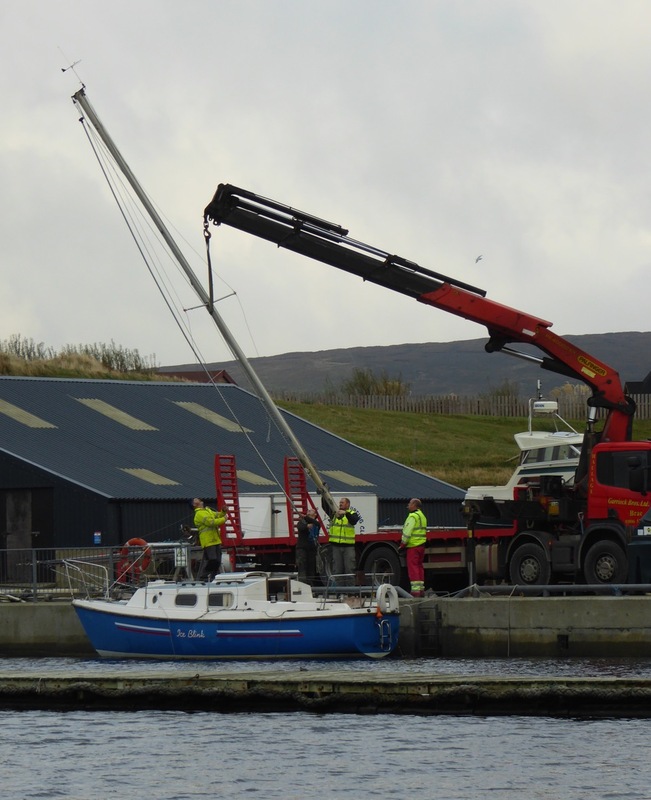 The Brae boats have always had masts down before November, for insurance reasons, but it’s only now our own marina at Aith has enforced the rule. I’m the only yacht here, so it seemed easier to sail up to Brae, take my mast down along with all the others to help, and motor home. And so today saw me heading down for the marina where my beloved Karima S is kept. For boating people, she’s a Van de Stadt Offshore 8m; for non-boaters, imagine a small camper van with a lot more wood inside, a pointy end and a mast. We have a lot of fun, Karima and I: every bonny summer day, we’re out on the water, enjoying the bird life, sailing out to poke our noses into the wild Atlantic, heaving to for a cup of tea or mooring up in an inlet for lunch, with the seals popping their snouts up around us, and the terns diving like white swallows. I got on my full sailing gear: wool gansey, teddy-bear suit, extra socks, boots, two jackets, and headed for the marina. Today was not a bonny summer day; it was late October, grey, with a suspicion of drizzle, and a good breeze that had had me worrying half the night about how many reefs I should put in. A reef folds away the bottom of the mainsail, and the general rule is that you do it before your over-canvassed boat gets unmanageable. The wind would be behind me, but even so I decided to go for two reefs, halving the sail area. If that meant we dawdled the seven miles to Brae, so be it. 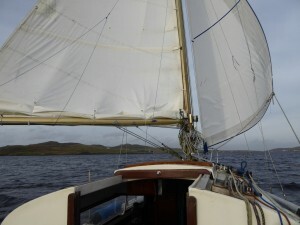 Still, I consoled myself, with two reefs I could unroll the jib, the front sail, which would make her better balanced. 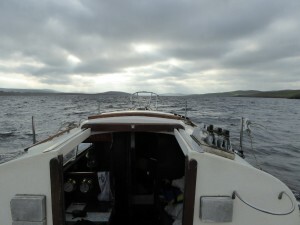 We headed out into the voe (the Shetland word for a sea inlet), switched the engine off, and set our noses northwards. Two reefs had been just right, I congratulated myself; my little boat was rolling gently along, with the waves whispering along her sides and breaking in a lace of foam at her prow. I unrolled the jib and began to enjoy myself. 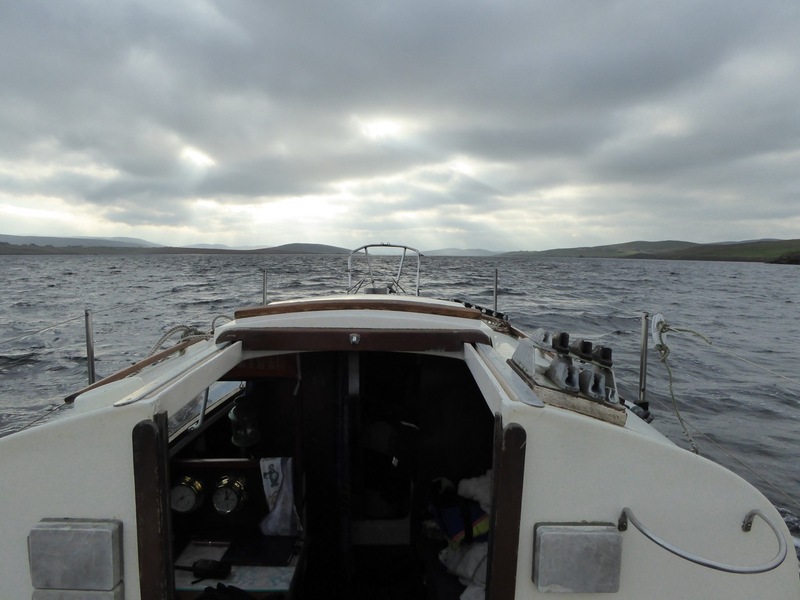 It was slightly scary fun; the wind was stronger than I’d usually go out in, creating long streaks of white along the backs of the moderate waves, and with the wind dead behind I couldn’t let the helm go for long. With two sails, though, she was surging forwards; this could be a record-breaking passage. The sun came out, lighting the auburn heather on the hills, and a kittiwake flew over me, looking down its nose at this unseasonal yacht. Then there was a rap and a flap from the bow, and when I looked forward, the shackle that held the foot of the jib to its furler had come unscrewed. The last two feet of the jib were pulling away from its metal track. Now I was in trouble. If I kept sailing like that, in this wind, I’d damage either the jib or the track. I couldn’t furl it away from the safety of the cockpit; I’d have to go forward to tie it down, and to do that I’d have to leave the helm, so I’d have to get the wind on her nose. I turned the boat head to wind. Instantly, there was a chaos of flapping sails, and the jib wound itself once around the track, the wrong way. Karima lurched, the waves threw her about, and we started drifting sideways towards the shore. I tugged at her helm, but the wind had us in its teeth now, and she couldn’t respond. I fired up the engine and rammed the throttle forwards. Juddering, she obeyed, turned, and we went back on track with the wind behind us once more. I contemplated the jib and decided on a plan B: to come around this headland and heave-to in the bay of Houbansetter. Heaving-to is a way of ‘parking’ a sailing boat by making the two sails work against each other. You don’t stay still on the water, but it gives you breathing space to fix whatever’s gone wrong. Modern boats don’t like it, but my Karima was built when boats were expected to do everything by sail, and she’ll sit happily with her sails crossed. I tightened everything in, tacked her and waited. She juddered over, tilted until her lower side was almost touching the water and waited there. Step 2. I took a piece of narrow rope and shoved it in my pocket. Heart in my mouth, I all-foured it along the up side to the prow, hands clutching each hold. It wasn’t a good day to go swimming. I braced my legs against the guard wires as I threaded the rope through the bottom of the jib and secured it around the bottom of the track. That should hold! My hands were shaking as I regained the safety of the cockpit. Now I could roll the jib up again. I hauled away on the furling line, steering with my legs and controlling the sail with both hands. Job done. We rolled gently onwards once more. Behind us, the sun was burnished with grey mist, and the sea was polished silver. I put the engine off and started to enjoy myself again, though the pace was now a bit sedate. I unrolled all but the last couple of turns of jib – that was better. 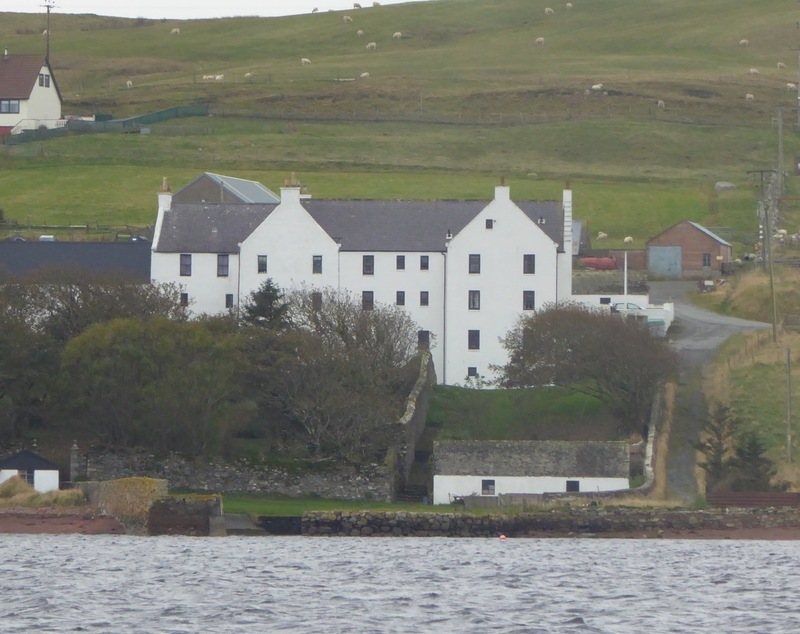 We sailed happily past the opening to the wild wide Atlantic, and past the crow-stepped elegance of Busta House, Shetland’s oldest inhabited house, with a romantic story of a Cinderella who brought the house to ruin to go with it. Busta’s my signal to get mooring ropes ready and drop the mainsail. The second I turned Karima sideways I felt the force of the wind again. The mainsail flapped wildly as I dropped it, yanking the boom under my arms as I stood on the cabin side, trying to gather it in. I hauled its elastics around it, and got back to safety. 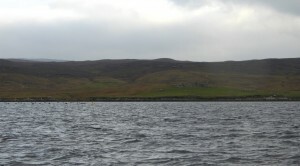 The waves were as high as the cockpit now, having gathered along the long fetch of Brae voe. Still, nearly there. I throttled back as we came into the sheltering arms of the marina, and got my mooring ropes ready. She was still too skittish for me to go forward and attach a rope to the prow, so I fastened one to the stern, and got the coil ready for me to pick up as I stepped ashore. I’m still not sure what went wrong. She berthed slightly squint, but near enough for me to step onto the pontoon; and then my boot heel caught in the rope, I think, and tugged it out of my hand, and the next I knew she was drifting away from me, heading for the boating club slip. If I was lucky, she’d end up alonside the projecting jetty. I began to run desperately up this jetty and round the rock arm, while my boat pirouetted in the circular space, with the entrance back out to sea scarily open. 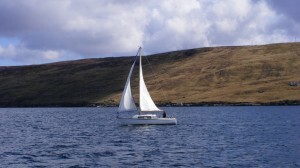 By now, Joe, at his own boat, had spotted her loose and was coming running, along with another boat owner. ‘Have you got an oar, to fend her off?’ he called. ‘It goes straight down!’ Joe reassured us. We all three scrambled down the rocky slope as Karmia drifted gently towards us. A huge rush of relief washed through me as I grabbed her guard rail and hauled myself aboard. Joe came up over the stern, and we backed away from the shore, turned round and headed back to the berth. Once she was safely tied in, I heated up a pan of soup, and treated myself to an Options white drinking chocolate. I felt I’d earned it! I spent the next hour undoing ropes. 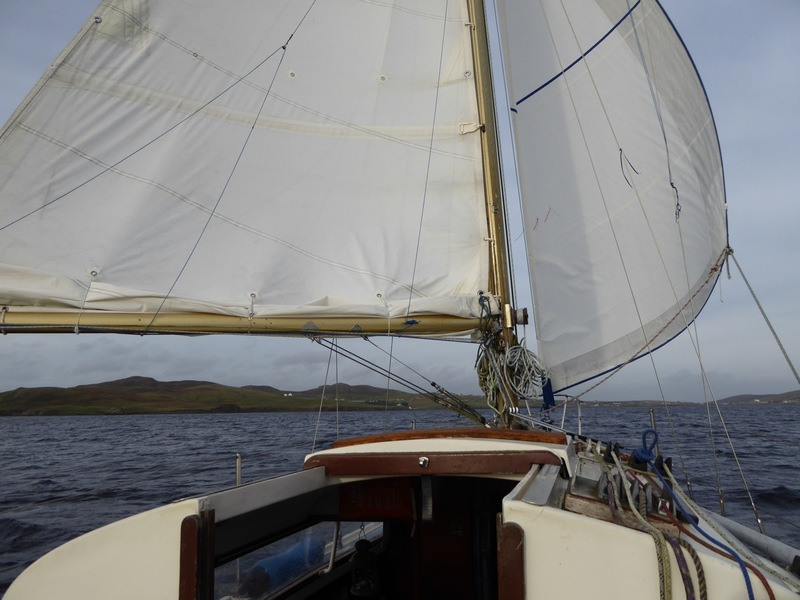 I’d forgotten how many bits of string have to be removed before the mast’s free to come down: the reefing ties, three halyards, the topping lift, all the gear for the spinnaker pole, the lazy jacks … I’d had enough wrestling with sails for one day, so I just bungeed the mainsail to its boom. The jib had to come down, but it slid down easily, with not too much flapping, and I managed to roll it up. All the ropes went in a rubbish bag to take home for washing. By the time my husband, Philip, came to collect me, I was nearly ready. He gave me a hand with getting the boom into the cabin – it’s metal, nine foot long, and weighs a ton – and then we headed home. Driving distance, fifteen miles, and time, half an hour. The next morning was the Day of Doom. I was up at seven, dressed in my sailing gear again, and ate breakfast as Philip drove me over. The crane was due to arrive at eight, and sure enough, it clanked down the hill at five to, parked beside the pier and spread its legs like a determined spider. 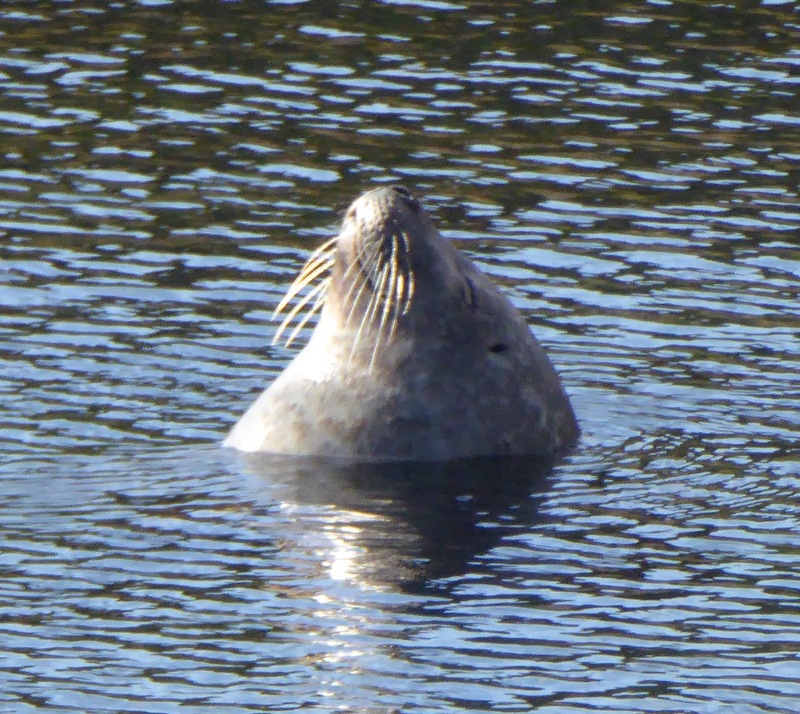 The marina seal sculled in, and poked his snout out to watch what was going on. The next three hours were busy: motoring each of the eight boats to the pier, and tying up. The crane driver operated his derrick from a control box at his waist: up in the air, swinging round to bring the canvas loop to the mast, where we unhooked it, put it round the mast, and stood back, watching it slide upwards without – we hoped – damaging any lights or pulleys on the way. Once the crane was supporting the mast, it was all hands on deck to undo the wires holding the mast up (eight of them, attached by long bottle-screws, plus a thick bolt at the foot). 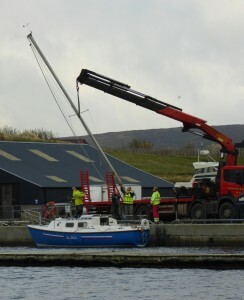 Then the mast went up into the air, with three of us holding it to guide it down safely. That boat backed away. Next. I must have clambered between boat and pier a dozen times, at least. After all the masts were off, the crane lifted each one again and swung it round to the cradle where they’ll spend the winter: more steadying of masts which, on the ground, suddenly became telegraph pole sized. At last, we had a neat pyramid of masts beside the club. The crane retracted its legs and headed off. I got back aboard my poor boat. She looked diminished, mutilated, without her mast rising proudly up to the sky. I hadn’t seen her like that for ten years, and I hadn’t realised what a shock it would be. Still, I promised her, if it came a lovely winter day, when we’d normally be sailing, I’d come down and sand off the bits of varnishing I hadn’t done over the summer. I’d get all her ropes properly washed, in the machine. And think, I added, how much safer she’d be through the winter gales, without her halyards rattling, and her boom cover flapping and needing re-tied. I could feel a miserable silence answering me. I didn’t feel very cheerful myself. 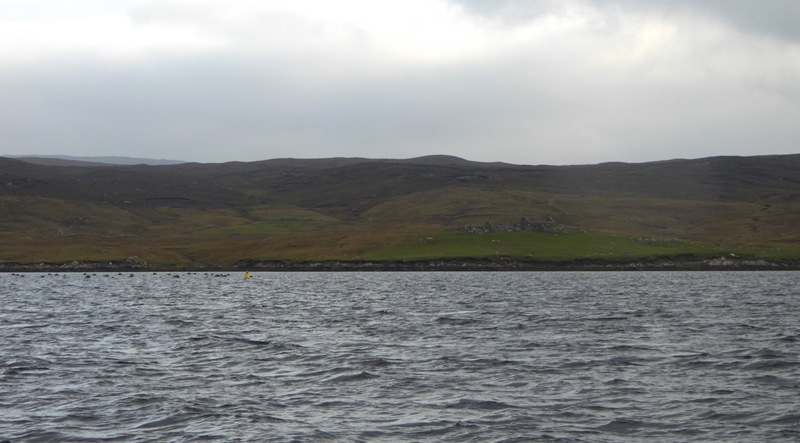 Even in the winter, it was a rare month when we hadn’t gone out at all, and we always had our traditional Christmas Eve hour on the voe – for some reason, Christmas Eve here is almost always still and sunny. Now we’d both be marooned ashore till April. If we’d had sails, it would have been a good journey home: a brisk breeze that would have zoomed us there in no time. As it was, under motor, into the waves instead of over them, the wind was bitter in my face, and I wasn’t sure whether it was raining, or just salt spray from the waves. The light was bonny, though, shafts of sun slanting down against the clouds, and turning the grey waves to shifting silver. A heron flapped over us as we came through Houbansetter. Ahead, the white houses of Aith gleamed. 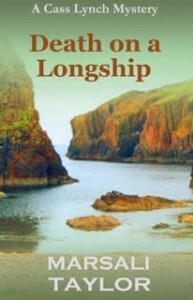 She was my longship. She floated beside the boating club pontoon like a ghost from Shetland’s past, her red and ochre striped sail furled on her heavy yard half-way up the wooden mast, her painted shields mirrored on the early-morning calm water. Okay, she belonged to Berg Productions Ltd, but I was her skipper. Stormfugl, Stormbird. She was seventy-five feet long, with a carved head snarling in a circle of teeth, a writhed tail, and a triangular log cabin on a half-deck in the stern. Gulls were wheeling around her, bickering among themselves, as if one of them had dropped a fish. I started Khalida’s engine and put-putted across the bay torwards the marina. I wasn’t keen on gulls dismembering fish all over my clean decks. I’d hosed them yesterday, after filming. The cameramen, lighting operators, make-up, costume, best boys, grips and all the hundred people that seemed to be needed for even a simple shot had squelched the path from road to shore into dusty gravel, which had clung to the sheepskin boots of my Viking oarsmen. The shore had added a generous helping of sand-laden algae. I didn’t intend to start the day re-scrubbing them. I’d fire the gulls’ fish overboard, and let them squabble about it on the water. It was amazing, too, that Anders hadn’t heard them. Even someone who slept like the dead, as he did, must surely be woken by them perching on the cabin ridgepole to stretch their necks at each other. I’d have thought he’d have been out to clear them by now. I looked at the body lying on the half-deck, one hand stretched towards the prow and felt my newly-won promotion to skipper slipping away. It was Maree Baker, one of the film lot, the stand-in for the star. I was ashamed of myself for thinking first of me, but I couldn’t help Maree now. She lay sprawled on the larch planks like a marionette washed up by the tide, the manicured nails still gleaming like shells in the bloody mess the gulls had made of the exposed hands. There was mottled dirt on her cream silk trouser suit. The red-gold hair falling across her face was stirring just a little in the breeze, as if at any moment she’d shake it out of her eyes and leap up. I looked again at the back of her head, tilted up towards me, and saw the pool of blood spreading out from below her stand-in wig. The gulls had left footprints in it, and across the deck. I’m not squeamish about blood, but I felt sick then. I yelled at the three that had only gone as far as the pier, orange eyes watching me, then looked back at Maree. I didn’t want to touch her, but I had to. I was the ship’s Master under God; captain, minister, doctor. I curved my hand around the chilling neck and laid two fingers over the vein. There was no flutter of pulse. I withdrew my hand and reached into my back pocket for my mobile. 999. No, here in Shetland, 999 would probably get me some Inverness call centre three hundred miles away, where I’d have to spell out every name twice. I wanted Lerwick. I dived into the boating club for a phone book, and found the number. There were two rings, then a voice. ‘I’ll stay with the body,’ I said, but made no other promises. I picked up a stone, and scattered the gulls with one vicious throw. 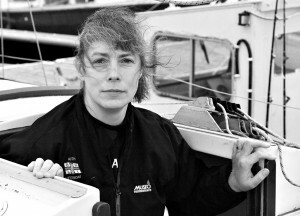 Marsali Taylor is the author of four Shetland-set crime novels starring her sailing heroine Cass Lynch. 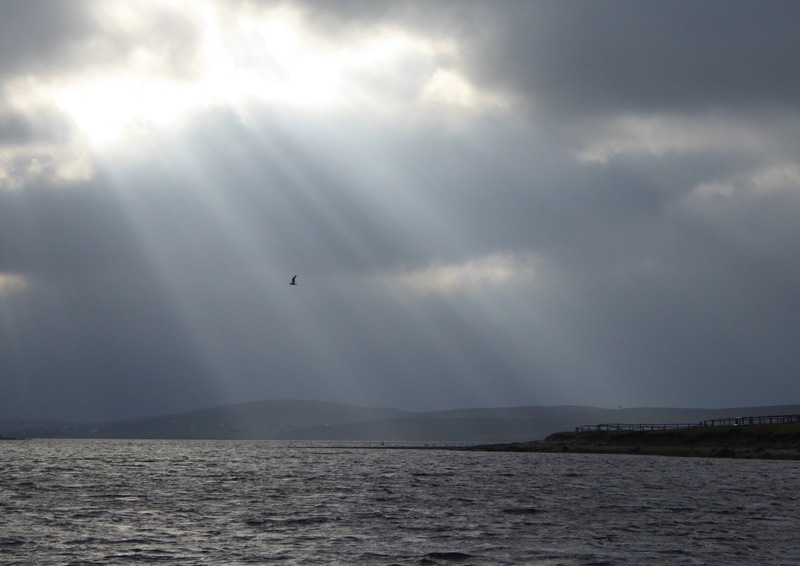 She came to Shetland’s scenic west side as a very new, very green trainee teacher, and remained in the same classroom for her teaching career. She’s also a tourist guide with a particular interest in women’s history. She lives with her husband, Philip, a tribe of unruly cats and two Shetland ponies. Many thanks Marsali- fantastic blog! Wow what a lovely introduction to your life and The Shetlands. I just wanted to read on and on and I could feel myself swaying a bit too much for my own good. I get seasick. Then the sample of your story – what a story it promises to be. A fab story-teller, thanks so much for hosting her Jenny. Loved it. Congrats Marsali. Wishing you much deserved success.